It all began nearly a year ago. Joe Montana teased what at the time was believed to be a mobile game by tweeting out a picture that was accompanied by the hashtags #youvewaitedlongenough and #joemontanafootball16. Ever since fantastical rumors have swirled, inexplicably fanned by the CEO of the company developing the game, leading to some unfortunate misinformation and seriously unrealistic expectations. Undoubtedly the community that grew around the game put themselves in a position to be crushed by the news that Montana is actually, yes, a mobile game. However the primary fault lies with those who pushed their own agendas. Many websites and “personalities” spread the false rumors not caring about accuracy, either ignorantly or purposefully, with the sole intention of generating views for their sites or Youtube channels. Of course there was “The Post” on Operation Sports, which I quickly debunked but many chose to still believe. That may have faded away if not for the now named “Superstar Games” CEO Damon Grow utilizing Twitter to tease those desperately looking for a Madden alternative by leading people to believe that’s what this game would be. Whether it was those hashtags mentioned earlier plus the #morethanarosterupdate one, suggestions the game would be a Madden competitor, mentions of the game taking inspiration from NFL 2K5, claims that their Career Mode would be better than NBA 2K’s MyCareer, or pointing out that Joe Montana was visiting the Microsoft campus during the height of the chaos that came with “The Post” – everything was done deliberately. Even Joe Montana retweeted an joke image made by contributor to this site and Hit The Pass, T.J. Lauerman, that implied 2K Sports was involved. Apparently there’s no PR person that oversees his account. Not only was very little was done to react to the misinformation but they were clearly trying to take advantage of it. Even big mobile games don’t have stories written about them far out from release, let alone a niche unlicensed football game. In many cases they aren’t even revealed until they’re already out on the app stores. So Montana and Grow were clearly basking in the attention their little game was getting. They even had people entering their emails into a shoddily thrown together website (something I wouldn’t recommend considering privacy concerns) before anyone even knew the purpose for which their email addresses were being collected. But what community had been built – football fans looking for another option within the genre – was torn down in an instant. Something Grow clearly knew was coming based on his body language in the reveal interview. 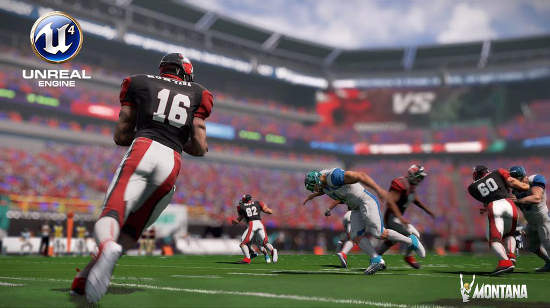 The mobile space is no cakewalk – there are a bunch of NFL licensed games already there, many of which including Madden are free-to-play. Odds are heavily against Montana Football proving successful enough to ever reach the PC, in fact there’s good reason to even wonder if it’ll make it to an iOS release. In the latest hangout video we discuss the implications of the news and the manner in which promotion has been handled, which now is resulting in a wave of backlash that will be difficult from which to ever recover.